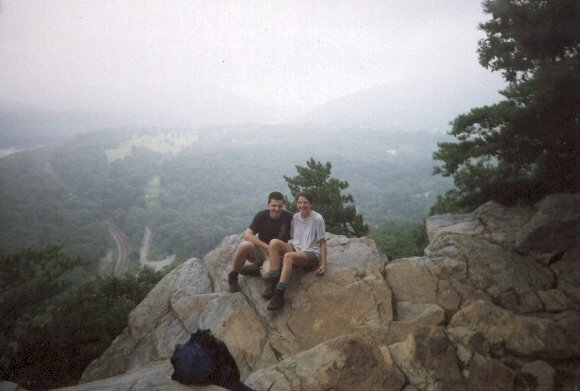 This 7 mile linear backpacking trip took place the weekend of August 2-3, 2003. Participants were Charlie Johnson, John Geisler, and me. 8/2/2003- All week, the weather forcasts were predicting various amounts of rain on Saturday and Sunday. I was concerned about this hike and whether it would happen. We had some people drop out due to various reasons. However, I had gotten so stir crazy from being home each weekend for the past 2 months that I was determined to do this hike alone if need be. So I went to Cindy D's Diner in Knoxville, MD on Saturday, August 2 at around 12 noon to see who would show up. John G showed up first. I was relieved that at least 1 other person showed up. Then Charlie J showed up. I felt better still. Then, Bill Isham showed up as well. Bill wasn't going to hike. But he just wanted to have lunch with us. It was a great lunch. Then Bill volunteered to shuttle us to the Gathland Arch at the top of MD271 to start our hike. That way, we could all leave our vehicles at Weverton RD at the end of the hike. This was not to be a long hike. The purpose was to visit the Ed Garvey Shelter, which was about a year old now, and camp there. We started the hike at around 2ish that afternoon. It was very hot and muggy. The skies were threatening. The terrain between the arch and the shelter was "rolling", since we were ridging along South Mountain. We made it to the shelter in about an hour. We were sweating profusely because of the humidity. The shelter was fantastic. It was built from huge logs that were apparently hauled up a road on the western side of the mountain. It was a 2 level shelter that slept 12-14. It had a fire ring, picnic table, lots of places to sit and an "art deco" styled privy. The only bad thing about this shelter was that you had to travel .4 miles steeply down the east side of South Mountain to get to the spring for this shelter. They should have built the shelter closer to the spring, in my opinion. So John and I trudged down the path to the spring with all of our water containers, filled up, then huffed and puffed our way back up the mountain to the shelter. It was here and then that it started raining. We didn't mind since it cooled things off a little bit. It rained lightly for the next half hour, then stopped. When we returned to the shelter we discovered that a couple from France had arrived to camp at the shelter as well. Charlie had already moved our stuff over for them. They were very nice and were very interesting to talk to. They were both graduate students and liked to hike. In fact, they were planning to hike the Andes Mountains in South America within the next week or two. That is what I call being adventurous. One of them has published a book, which is listed on amazon.com. A group of scouts and some of their fathers arrived later that afternoon. 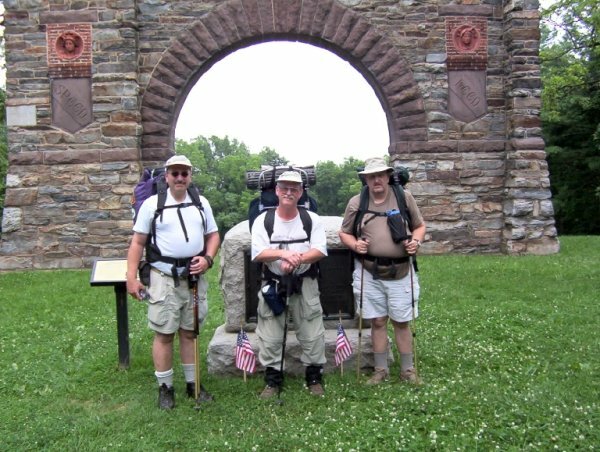 They were planning to section hike the AT in MD for 2 or 3 days and this was their first night on the trail. One of them worked at the same place that fellow Rag Tag Ranger Jerry Robey works. The scouts took the upstairs portion of the shelter. We had a good evening talking with our fellow hikers and eating. We retired around 9ish and had a pleasant and uneventful night. 8/3/2003- The next morning John got up first around 6AM. The rest of us followed shortly thereafter. Charlie had the radio on first thing to see if his job had gone on strike. After that, everyone in the shelter was up. We had a good breakfast, said goodbye to our fellow guests and started south on the AT. The scouts were heading north, but the French couple were heading south as well. 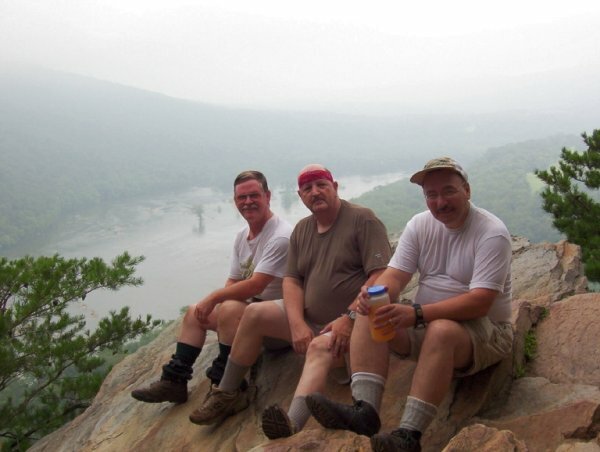 We started way before them but they caught up to us before we got to Weverton Cliffs. Either they are really in shape or we are really out of shape. Probably both. Anyway, we chatted with the French couple again at Weverton Cliffs. 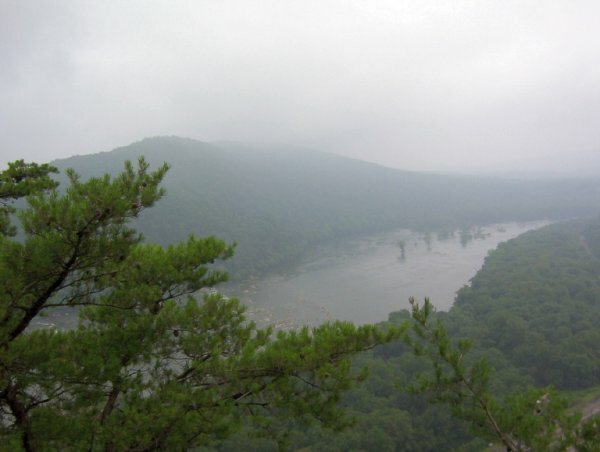 This is probably the best scenic view on the AT in MD. I could spend all day here just staring out at the lazy flowing Potomac River below. The French couple left first as they were going to hike more of the AT later that day. We lingered a bit longer, then hiked the big down back to our cars at Weverton RD. We got done at around 10AM. We went back and had breakfast at Cindy D's. Then departed for home at around 11ish. So we dodged the rain for the most part. This was a nice and easy hike. 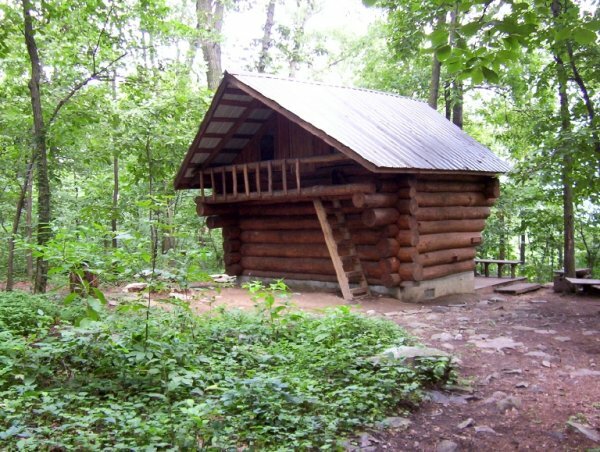 The Ed Garvey shelter is, in my opinion, the best AT shelter in MD (the Ensign Cowall Shelter is a close second) and one of the best on the AT at this point in time. As always, we met some really great people on this trip. The only downers were the high humidity and the long haul to the spring at the shelter. Otherwise, this was a nice, easy and fun weekend backpacking trip. Please note that Cindy Dees Restaurant in Knoxville, MD closed sometime around 2010. Another restaurant opened there in 2014 called Lowrys. Unfortionately, it closed in 2016. Not sure what, if anything, is there now. 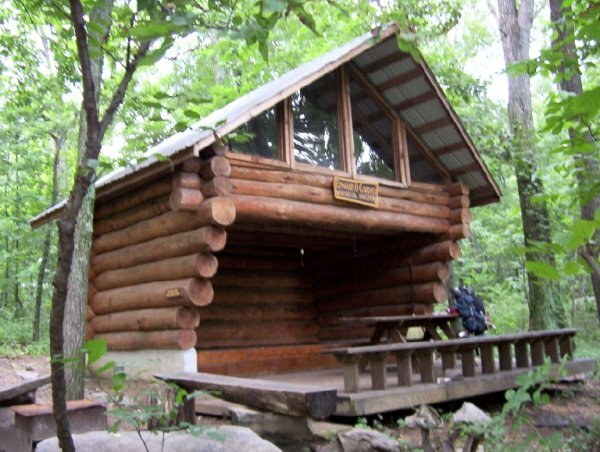 Front view of Ed Garvey Shelter, MD. Rear view of Ed Garvey Shelter, MD. Couple that stayed at shelter.